NEW YORK, Oct. 2, 2018 /PRNewswire/ — Benedict Peters, CEO and Founder of Aiteo Group was bestowed the accolade of Oil & Gas Leader 2018 by Forbes Africa Magazine at a VIP reception in New York September 27, 2018. 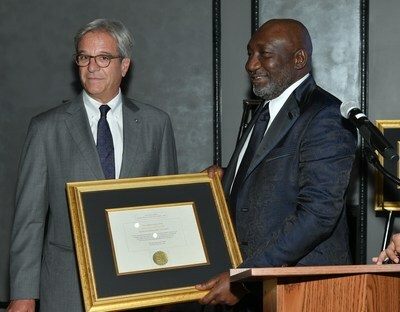 The Forbes Award recognized not only the entrepreneurial achievement of Mr. Peters in building Aiteo Group in the past 10 years since its 2008 formation into one of Africa’s fastest growing integrated energy businesses but also his commitment to bettering the life of people and societies across Africa by philanthropic engagement. Since 2014, “Benny” has been Chairman of the Joseph Agro Foundation, a community level-based charity aiming to improve the lives of rural farmers through a combination of education and practical assistance. Working with the Face Africa organization he has helped bring clean drinking water and improved sanitation to some 25,000 people in Liberia. A keen believer in the power of sport to motivate and inspire youth, Benny has also provided support to sports, sponsoring the Nigeria Football Federation for a five-year period, providing assistance to the Confederation of African Football Awards and the Aiteo Cup. Another initiative pursued by Mr. Peters is tackling the issue of internally displaced persons within Nigeria through contributions to the Adamawa State Emergency Management Agency. Some 2 million people face economic hardship and poverty which is a barrier to social well-being and economic prosperity which he is determined to champion. Aiteo Group is an integrated energy, mining, agriculture, infrastructure development, electricity generation and distribution enterprise focused on serving the needs of communities across the African continent by leveraging a unique combination of a strategic asset base, technology and innovation. Aiteo group has rapidly expanding geographic presence in the DRC, Ghana, Guinea, Liberia, Zambia, Zimbabwe as addition to offices in Geneva and Paris.